The Sir John Cass Foundation funded project for the London ambassador scheme for learners with disabilities, concluded the findings of the project through the dissemination event on 23rd April at Queen Mary University London. This three year project demonstrated that sustainability of intervention was key to learner progression, to further and higher education, that teacher awareness of the progression issues was vital in over coming barriers to FE and HE. 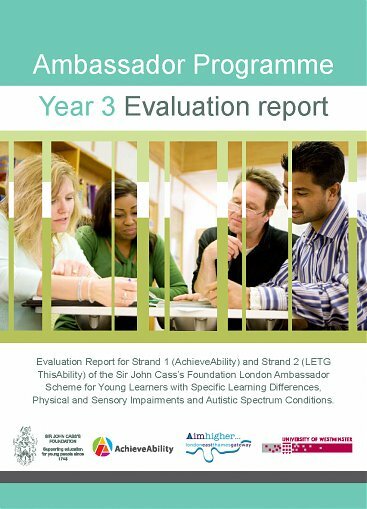 The executive summary of the evaluation report outlined some of these key findings from the work with London East Thames Gateway AimHigher partners and the Sir John Cass foundation in delivering this project to learners in schools and colleges who have either specific learning difficulties, physical and sensory impairments and autistic spectrum conditions. 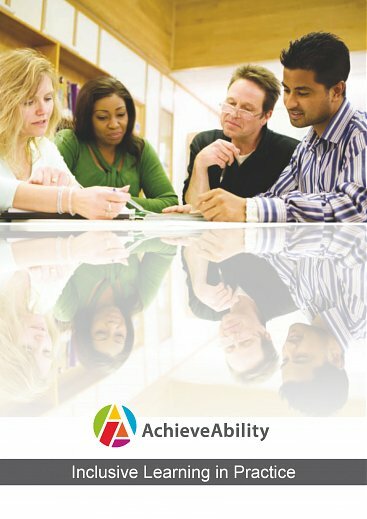 Edited and compiled by Katherine Hewlett: The Framework was produced from action research undertaken by the AchieveAbility in partnership with East of England Aimhigher, Quintin Kynaston School and Northallerton HMYOI. 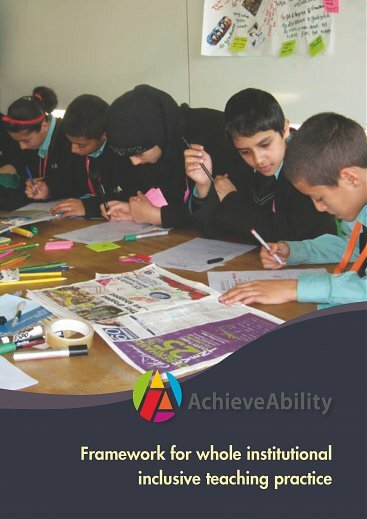 Inclusive Learning in Practice is an innovative programme which was devised in partnership with , LLU+ South Bank University (the validating institution),the West London Lifelong Learning Network and AchieveAbility. Appreciation goes to Dr Ross Cooper for his steer on the devising the module and the validation of the module. Appreciation also goes to Dr Graeme Hall for facilitation of this module. It aimed to support teachers' development of inclusive practice working with learners with learning differences with specific reference to the teaching and learning of their specialist subject. A pilot happened achieved by means of twelve taught sessions and an action research project, all of which enable participants to focus their study on their own classroom practice in the context of their own particular needs and those of their schools and colleges. SpLD the way forward is a multimedia CR-ROM that was developed byDyslexia Action in collaboration with the University of Westminster, on behalf of the AchieveAbility project. The CD-ROM contains detailed information on SpLDs, opportunities in HE, student rights, financial advice, application process and case studies of HE students and professionals with SpLDs. The highlight of the CD-ROM is the crystal presentation of SpLDs which can be viewed in the definitions section of this website. SpLD the way forward can assist in increasing awareness amongst learners and staff about SpLDs and inspire learners with dyslexia, dyspraxia and dyscalculia to consider progression to Higher Education. From 2005 - 5,000 inspirational CD ROMs were produced and nationally distributed to schools, colleges, connexions services, Aimhigher partnerships, learning skills council, HE disability officers and other educational professionals and agencies.